Hey Man, how about this alternative? 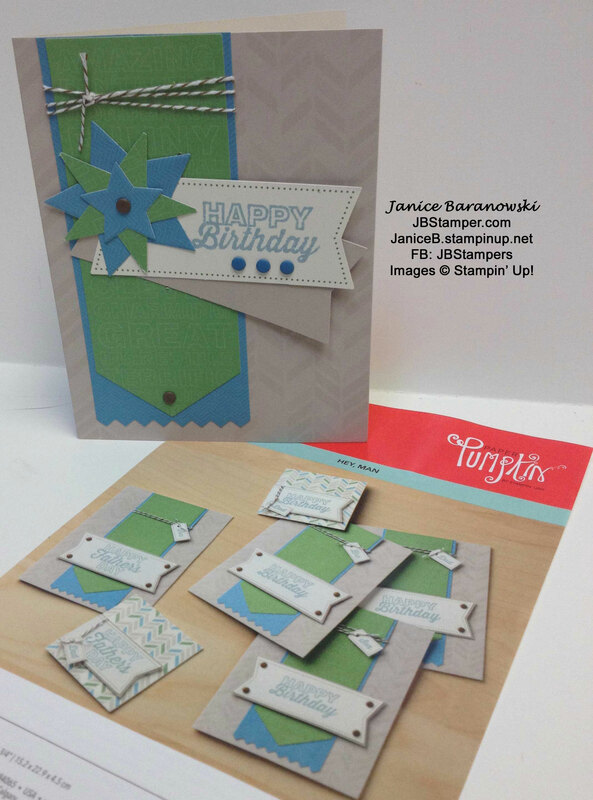 May 2014 Paper Pumpkin kit came out just in time for Father’s Day cards. The only problem, I had already designed 8 masculine cards for my Father’s Day card classes. So it sat on my craft table and I kept looking at every couple of weeks. I really liked this color combination, but I didn’t need any more masculine cards right away (what you say, you always need masculine cards and they are so hard to create!). So roll forward to late June 2015 and I decided it was time to find an alternative design to make this Paper Pumpkin kit. So off to Pinterest. Does anyone else go to look for just one thing and 2 hours later you’re still looking at ideas?? LOL, me too! I found a lot of cute ideas on Stampin’ Up! Paper Pumpkin board, so I started combining ideas until I came up with this one. I wanted more “Happy Birthday” cards than Father’s Day cards (yes another Father’s Day – 2015-had already passed with more card I created for those classes), So I made mine a birthday card. I haven’t made the little note cards yet, but they will also be for birthday gift note tags to match the birthday card when I need them. Don’t forget the special 50% off the first 2 months kits when you sign up for your own Paper Pumpkin kits by September 10. This entry was posted in Birthday cards, Father's Day, Paper Pumpkin and tagged Birthday, Father's Day, masculine, Paper Pumpkin, Paper pumpkin alternative, Stampin' Up!. Bookmark the permalink.